This is the ultimate shoulder season dish. Some people are happy to use fall vegetables as soon as they appear at the market, but I like to hang onto summer as long as I can. 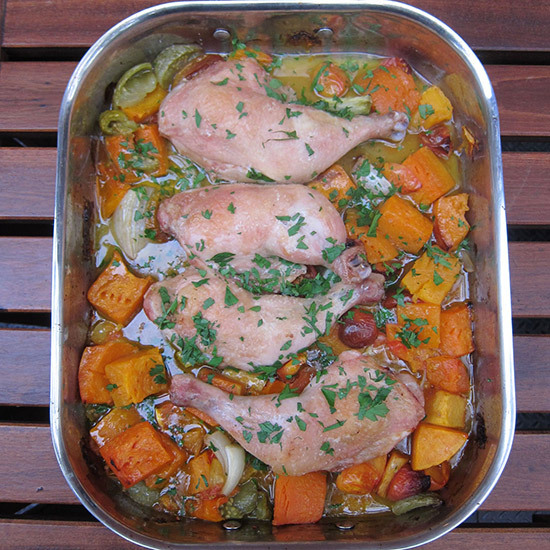 That said, tomatoes and winter squash are delicious together, so I cook both of them with chicken legs for a rustic one-pan roast. The squash in this dish becomes quite soft and infused with both the chicken and tomato juices. If you prefer crispier-style roasted squash, cook it on a separate baking sheet, then add it to the tomatoes just before serving. To pull together this dish quickly, use the prepped squash available at many supermarkets. Then serve it with a happy Beaujolais. 1. Preheat the oven to 425°. In a large roasting pan, toss the squash, tomatoes, onion and herb springs with 2 tablespoons of the olive oil and season with salt and pepper. Brush the chicken legs with the remaining 1 teaspoon of olive oil and season with salt and pepper. 2. Push the vegetables to the side of the pan and arrange the chicken in the center. Roast the chicken and vegetables in the upper third of the oven for about 45 minutes, stirring the vegetables once or twice, until the chicken skin is lightly browned and crisp and an instant-read thermometer inserted in the thickest part of the meat reads 165°. 3. Transfer the chicken legs to plates, garnish with parsley and spoon the vegetables alongside. Serve hot. One serving 462 cal, 21 gm fat, 4.6 gm sat fat, 24 gm carb, 4 gm fiber, 41 gm protein. Wine A fresh, berry-fruited Beaujolais.